The years 1970-72 saw industrial struggle in the UK reach levels which hadn't been seen since the 1920s. 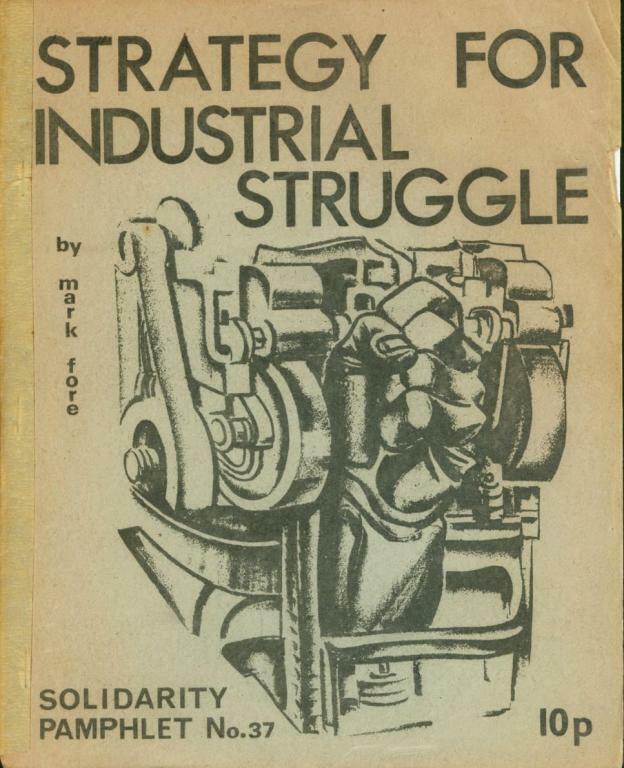 This pamphlet by "Mark Fore", a pseudonym of Ken Weller, set out alternatives to traditional strike strategy. Published by Solidarity (London) in May 1971. The aim of this pamphlet is to help along the discussion now going on amongst industrial militants about a more flexible and imaginative approach to industrial struggle. For far too long militants have tended to react in a thoughtless, and almost reflex manner to problems of wages and conditions, calling uncritically for more frequent or longer straightforward strikes, without seriously considering whether there might be other options open to them for hitting the boss, options which in many circumstances are both more effective and cheaper for workers to carry out. Militants have too often concentrated on the techniques, of getting workers out of the gate. Strikes are often entered into without due and proper consideration of timing, selectivity, and the general tactics of the struggle itself. Today, with the pending introduction of the Industrial Relations Bill, a discussion of these topics is relevant and urgent. The focus of struggle will increasingly shift from the trade union branch or Head Office to the shop floor. And as power workers (who are already restricted by law from strike action) 1 have recently demonstrated, there are more ways of killing a cat than drowning it in cream. Once the Bill is law (and, despite all the shouting, we can take it as granted that the union leaderships will register and cooperate with the new Registrar) there will in fact be no way to combat its provisions other than by 'lawbreaking' on the widest scale. To compromise will be to lose. No one wants martyrs, but in the long run a resolute struggle will mean less victimisation, as well as less damage to job organisation, than a situation where isolated militants can be dealt with, one by one. In considering the techniques of struggle available, we need both initiative and imagination, and some familiarity with what has been done in the past. There is a tradition, fortunately not entirely dead, of a much more sophisticated approach to industrial struggle than what is usually proposed — even by so-called 'lefts' — today. Since Social-Democracy and Bolshevism became the dominant ideologies in the labour and socialist, movement they have seriously undermined this revolutionary tradition. Both of these currents see themselves as riding to state power on the backs of a politically unconscious horse (the working class) — if you see what we mean ! This is not only how they analyse things, but how they prefer them, for it leaves them in ultimate control. Such methods of direct action as are described in this pamphlet, which depend on a high and developing level of consciousness, run directly contrary to the long-term interests of all the 'vanguardist' and 'elitist' organisations, for these methods make such organisations superfluous. f) methods of increasing the 'cost effectiveness' (for the men) of 'normal' strikes. We will be concluding by seeing how these various methods of struggle, in addition to being of value in themselves, fit into the framework of an overall industrial strategy, Itself related to our ultimate objective of a socialist society, based on the management of production by the producers themselves. One of the greatest unsung stories of the industrial working class movement is that of elemental resistance at the point of production. Work is not usually a pleasant occupation. But the matter goes much deeper than a natural and commendable generalised ergophobia among the working class. In general, there is a direct conflict between the needs of production and the human interests of the producers. From this — and whatever the level of wages — flows one of the basic contradictions of so-called 'efficient' capitalism. This conflict cannot be resolved without a fundamental change in the relations of production, i.e. without a vesting of fundamental decisional authority in the hands of the workers themselves. This informal resistance, which goes on even in formally unorganised shops and sites, is what makes the difference between potential and actual production. Much of what is called 'industrial sociology' is devoted to research into reducing this gap. 3 This working class resistance is expressed in such methods as piecework ceilings, agreements amongst workers as to what constitutes a fair day's work, and in a simple refusal by workers — in a thousand small ways — to participate in their own exploitation. It is attempts by management to solve this contradiction which explains the steady and massive expansion of work study, job evaluation, quality control, progress-chasing, critical path analysis, inspection, and related pyramids within industry. All of these would be totally unnecessary in the absence of resistance. Management's second line of approach to solve this problem is to introduce 'workers' participation'. In doing this they try to motivate their employees to identify with the interests of the company. Sooner or later workers see through this fraud, which seeks to ensure their silence by a spurious and empty representation (in a minority capacity) on various administrative bodies. In the long-term all these measures fail. An example of this resistance was given in 'The Renault Story', by Ken Weller (Solidarity, Vol. I, No. 8). This described the experience at the small Renault assembly plant in North West London. In 1961 the management decided to close the factory down and to import completed cars from Belgium. But as they had a last batch of cars to complete before closure they offered the workers a deal. The workers would receive the total wages they would they would have earned had they worked at normal speed (43 cars per day) even if the batch to be completed was finished faster. The men held a shop meeting and decided that as they were going to get the bullet anyway they had nothing to lose by finishing the job as soon as possible and then having a holiday. So they organised the job themselves. They increased productivity to 120 vehicles a day in spite of resistance by the management, 4 who felt (rightly) that such an increase reflected on their ability to manage. This incident gives some idea of the scale and economic effect of resistance on the shop floor. It has been estimated that the loss of production resulting from such resistance is — in any given period — about equal to the volume of production itself. A good example of how even unorganised workers make their feelings felt took place in 1952 at Price's Tailor's factory, Leeds. A worker was sacked by an uppity manager for allegedly sleeping on the job. The workers stopped work, forced the reinstatement of the worker but failed to get the manager sacked ... 'all the workers therefore booed him whenever he entered one of the workrooms. As a result he kept out of sight and stayed in his well-heated office'. (Freedom, March 1, 1952). The effects of this movement were widespread : power cuts, shortage of coal, something very close to sabotage on the railways. Dr. Husak, in his eve of anniversary speech, referred to the fact that 'honest workers' were being made 'the objects of ridicule' — a situation which will be thoroughly familiar to militants who have seen how workers react to 'tear-arses'. Ridicule is usually the mildest sanction. (See Victor Zorza, The Guardian, October 22, 1969). East and West the real struggle goes on, day after day, ignored and undocumented. It has nothing to do with who detains political power. It is related to the fact that the producers have no real control over the productive process and this control is in the hands of an external agency : the managerial bureaucracy. The struggle in production is the major symptom of the most fundamental crisis in class society : the inability of modern capitalism (whether of the private or state variety) fully to integrate workers into the productive process. Sabotage is an emotionally loaded word. It sends shivers or thrills down the spines of employers and mindless militants. But the reality is both less sensational and more significant than the myth. Sabotage is essentially a part of the informal resistance. It usually takes the form of individual actions. Taken altogether it is undoubtedly a significant form of struggle. In his book 'Strikes — A Study in Industrial Conflict' (Basil Blaokwell, 1954) K. Knowles describes how men used to fight the speed-up. Knowles quotes : 'When it got over sixty, say, somebody would just accidentally drop a bolt in the line and as soon as it worked its way round to the end, bang, the line would stop. Then there would be a delay and everyone would take his break'. This quotation could almost be about Ford at Dagenham. At one time in the early sixties, on the firm's own admission, damage to the track was costing thousands of pounds per year. (see 'Who Sabots ? ', by John Lane, Solidarity, Vol. II, No. 1). The same sort of thing goes on in every industry : neglecting to maintain or lubricate machinery at the correct intervals, pushing buttons on complex electronic gear in the wrong order, putting pieces in the wrong way, running machines at the wrong speeds or feeds, dropping foreign bodies in gear boxes, 'technological indiscipline' each industry and trade has its established practices, its own traditions. Another common form of 'sabotage' consists in literally carrying out managerial instructions, even when they are known to be wrong. I had experience of this in a piecework shop where consistently and obviously wrong blueprints were carefully worked to. Everyone in the shop (including the foreman) knew that they were drawn 'left-handed' instead of 'right-handed' (this is a fairly common draughting fault). The shop was suffering a sense of grievance — so everyone closed their eyes. It is a mistake to see lower supervision simply as a tool of higher management. They often have distinct interests and grievances of their own, which any reasonably intelligent steward can often exploit. At Ford it is not unknown for the most obviously faulty vehicles to pass right down the track. In fact it is the minor defects, which inspection is better organised to detect, that result in a vehicle being pulled out. Examples of what may go right down the line are bodies with two doors on one side and one on the other (quite a good idea, if you think about it for a moment), or bodies with fittings for the foot pedals on the left and the steering wheel on the right (not such a good idea !). Sabotage has even been used as a direct bargaining counter. A New York report in the 'Manchester Guardian' (March 6, 1948) stated that theatre operators and projectionists secured a new two-year contract and a 15% rise in wages by an unofficial campaign which had startled audiences with films shown upside down, alarming noises from the sound machinery, mixed reels from other films, and films projected onto the ceiling instead of the screen ! Even if the suggested relationship between sabotage and poor organisation were true (and it isn't), most workers are employed in poorly organised plants. This would in no way reduce the significance of this method of struggle. Every industry is covered by a mass of rules, regulations and agreed working practices, many of them archaic. If applied strictly they would make production difficult if not impossible. It is often forgotten that many of these rules were introduced to safeguard managements' liability in the event of industrial accidents. Managements are quite prepared to close their eyes when these rules are broken in the interests of keeping production going. In many situations the selective application of rules can be a very potent weapon in the workers' hands. Even the modest overtime ban can be effective, if used critically. This is particularly so in industries which have an uneven work pattern. We will now give a few representative examples of how the work to rule has, in the past, been applied in various industries. 'Every conceivable safety precaution is being applied, some of them dating back well into the last century and made obsolete by port improvements. 'Locks have never been filled so slowly. It is many years since the levels were so minutely checked with a plumbline, or swing bridges so carefully examined lest a belated reveller be sleeping off a hangover on the turntable beneath. 'Lock-keepers too have unsuspected responsibilities when it comes to identifying ships and their masters or making sure that all the fire regulations are observed. Tugs are hedged in with speed and movement regulations. 'When under nationalisation, French strikes were forbidden; their syndicalist fellow-workers were delighted to urge the railmen to carry out the strict letter of the law ... One French law tells the engine driver to make sure of the safety of any bridge over which his train has to pass. If after personal examination, he is still doubtful, then he must consult the other members of the train crew. Of course trains run late ! 'Another law for which French railwaymen developed a sudden passion related to the ticket collectors. All tickets had to be carefully examined on both sides. The law said nothing of city rush hours ! (What's Wrong with the Unions, by Tom Brown. A Syndicalist Workers Federation pamphlet, p.11). There have been many successful work-to-rules in Britain too. Here is an account of a struggle by a group of toolmakers after their wage demand was turned down. It took place at Standard Telephones and Cables, in New Southgate, in 1962. The distinction between a 'work-to-rule' and a 'go-slow' is an arbitrary and often mythical one. A work-to-rule is usually highly selective in its application of rules and is rarely accompanied by normal working in areas where rules do not apply. This heartrending 'cri de coeur' by the Ford Motor Company was published in the report of the Jack Court of Enquiry (C.M.D.E. 1999, April 1963, H.M.S.O., p. 57). It is a pity that this great tradition of 'working normally' is not as strong at Ford's as it used to be. But matters are beginning to improve. "You are going back to work at the old wage. The employers have repeated time and again that they were delighted with the work of agricultural labourers who had taken our places for several weeks during the strike. But we have seen them at work; we have seen that they could not even walk a vessel, that they dropped half the merchandise they carried, in short that two of them could hardly do the work of one of us. Nevertheless, the employers have declared themselves enchanted by the work of these fellows; well, then, there is nothing left for us but to do the same and to practice ca' canny. Work as the agricultural labourers worked. Only they often fell into the water; it is useless for you to do the same." 'In everything they did the men were unhurried in a way that looked deliberate. There was evidence that their actions were planned. True, the cranes were working and goods were passing from the dockside to the ship, but there was a leisureliness about the proceedings that made everything seem half-hearted. 'I soon learned the reason. At the moment bags of sugar were going aboard in slings. But it was pointed out that the slings were carrying only 4 at a time instead of the normal 12. Yet even the reduced number seemed to take just as long to be freed and the sling returned for more. Meanwhile the men on the dock below waited patiently until it came back, standing or sitting and chatting. Sometimes, after a load had been fixed and the crane had started lifting, a fault appeared to be observed. There was a call to the craneman and down it came again to have the hooks seen to. 'The men who brought the goods from the warehouses to the dock were equally leisurely in their movements. There were always several with nothing to do at all outside the ship. 'Any excuse appeared to be good enough as an excuse to stop work. There was a general stoppage for instance when I and my P.L.A. (Port of London Authority) guide approached. It was obvious we were the subject of discussion. The men were frankly suspicious. Only a day before a press cameraman visiting another dock was mobbed. The men became very ugly in their attitude and hurled epithets at him and the press generally. But for the protection of a dock policeman he might have been maltreated or at least have lost his camera. 'The effect of the "go-slow" working, said a Port Officer, is not only causing ships to be held up in London Docks for weeks before they can be dealt with, but it results in losses to the contractors who are employing the men. Under normal conditions a gang of 13 men could load or discharge 200 tons of sugar a day. Now the tonnage seldom exceeds 50. They could deal with 125 tons of timber, now it is about 25.' (Daily Telegraph, July 13, 1945). Power Workers' Dispute, 1962. Due to their special legal position power workers have developed an expertise in work restriction which should be made much more widely available. 'The ways in which the work-to-rule operated in the West End District were many and varied because of the multiplicity of jobs and because of the militancy of the men doing them. In some cases it was a simple overtime ban. In others, many subtle interpretations of working rules were discovered which led to discussions with the management reminiscent of mediaeval theological disputes. 'Amongst the methods used were a refusal by drivers to move or help move any material beyond the tail board of their vehicles. Electricians would refuse to touch main fuses and would insist on waiting for an Installation Inspector to remove the fuses before the job could start. The Inspector would also have to replace the fuses when the job was done. Nor would electricians or their mates do any labourer's work. This meant that every time a cooker or other appliance was moved into a house, a van driver, a couple of labourers, an electrician and his mate, and an Installation Inspector would all be needed — 6 men at least. This applied to many other jobs too. 'If a job was inaccessible, the men would patiently wait until London Electricity Board step-ladders were brought from the depot. They would refuse to use the householder's ladders, since they were only insured for L.E.B. equipment. 'In some cases the engineers in charge, instead of closing a turbine down when it was left unattended would tell the turbine driver to leave it running at a set speed. This can and did have very important consequences. A turbine is usually slowed or speeded up according to the load required. If the load required exceeds by a certain factor the output of the turbine while it is running at a set speed, the turbine automatically cuts itself out and sheds the load onto the other turbines. In conditions of maximum output this in turn overloads the other turbines. This can have a cascade effect, closing down the whole station, as each turbine cuts itself out as it becomes overloaded. This in fact did happen. This excellent in-built safety mechanism makes sure that equipment is not damaged by excessive loads. 'Other methods used at Battersea included the refusal of the coal conveyor gangs to work with even a single man less than the prescribed quota. They also refused to accept transfers from one gang to another to make the number up after the start of a shift. The effects of these methods, which were increased by the very high sickness rate also prevailing at Battersea, led to conveyors being put out of action. In turn this meant that coal barges took much longer to unload. Many barges were in fact sent away half full. In fact the fuel shortage at the station became quite crucial towards the end of the work-to-rule. The Post Office, with its byzantine system of rules and working practices and reliance on massive overtime working, is an example where optimum conditions for working-to-rule seem to exist. It is a great pity that serious thought was not given to this technique before the recent strike was entered into. 'By January 8, mail due for sorting was being directed as far as Edinburgh, Portsmouth, Cardiff and Peterborough. This diversion of mails for purposes of sorting created problems of its own. A union spokesman "claimed that 350 bags of correspondence for Essex, diverted from Mount Pleasant to Peterborough, had been relabelled and. sent back to Mount Pleasant because the Peterborough office was full ! On receipt at Mount Pleasant, the postal authorities had instructed members of the UPW immediately to send the 350 bags back to Peterborough". (Evening News, January 10, 1962). The bureaucracy was now in firm and exclusive charge ! 'Interesting developments took place at many railway stations. The rules lay down that Post Office staff are supposed to handle letter-mail, and railway staff parcel-mail. Normally both groups work together. The job is done : both parcels and letters catch the appropriate trains. Workers organise together on the spot. They ignore the artificial divisions which the "nationalised" Post Office and the "nationalised" Railways attempt to build up between them. But the postal workers now decided to implement the rule. This resulted in widespread delays in the mail. During December 1961 the UPW published a 'Brief Guide to the Regulations Governing the Performance of Post Office Work'. Although this was marked 'strictly confidential to members of the UPW', we consider it worthy of wider publicity. It is in fact a model of how this type of struggle could have been organised. But it remained largely a paper model. Its possibilities were not fully exploited. As the dispute developed the UPW leadership took fright of the Frankenstein it had itself created. Thousands began rigidly to obey the rules. The campaign was beginning to tell. But then the UPW leaders called off the dispute, on the basis of a flimsy promise. The 'Guide' lists certain rules which, if rigidly followed, could disrupt the functioning of the Post Office. This is done quite systematically. Each grade of Post Office worker is considered. Chapter and verse are provided for each statement. Mr Ron Smith and his colleagues on the UPW Executive must have burnt the midnight oil, preparing this remarkable document. Will the government prosecute them for conspiring to incite people to ... massive compliance with managerial instructions (the most efficient form of sabotage yet devised by industrial workers !!) ? 'All packets must be carefully handled, especially those marked "Eggs", "Glass", "Fragile, With Care", and the like. Fragile packets must never be thrown or dropped into bags or other receptacles', (R.G.13. A.1. 3) (This excellent rule is followed by another which will doubtless delight all recipients of eggs by post, namely : 'A postman must not sit or recline on mailbags' (R.G.13. A.IX, 3.). 'Bags taken up or downstairs must not be dragged or jolted from step to step' (ibid.). 'A postman is forbidden to put any postal packet under a door or through a window of a house ... even when requested to do so'. (R.G.13. A.III. 2a). The 'Guide' contains several dozen such excellent rules. There is little doubt that their complete and prolonged observance would have resulted in the Post Office gradually grinding to a standstill while the men went on receiving full wage packets. One of the serious problems facing militants in general and workers in the service industries in particular, is that of isolation from the general mass of the population. This enables the authorities to whip up 'public opinion' against the strikers. This isolation may be so marked a feature of certain struggles that one gets the impression that some workers, on the buses for example, see their passengers as almost as much the enemy as the boss. One way round this problem is to consider techniques which selectively hurt the boss without affecting other workers — or better still are to the advantage of 'the public'. The 'good work' strike often does just this as well as having intrinsic merits of its own. The 'good work' strike is a general term which means that workers provide consumers with better service or products than the employer intended. An example would be if shop workers consistently under-charged and gave over-weight. Or if workers building working class flats put the best quality craftsmanship even into the most shoddy materials. Obviously there are numerous occasions when the good work strike is not a serious proposition, but it could certainly be used more often than it is. For instance if car workers took the companies' hypocritical appeals for 'more quality' seriously, it would be interesting to see managerial reactions when they got 'more quality' than they bargained for. One good side-effect of the good work strike is that it places the onus of stopping a service on the employer. 'Today conductors and tram drivers arrived at work as usual, but the conductors did not pick up their money satchels. 'On the whole the public seems to be on the side of these take-no-fare strikers and schoolboys are having the time of their lives. Holidays have begun, and they are hopping rides to pass the time.' (The Times, July 2, 1968). Paris Metro. On the Paris Metro tickets are punched as passengers come onto the platform — and a ticket bought on one day can be used on another. Selective strikes of ticket-punching personnel enable hundreds of thousands of passengers to travel free. Such strikes are not resented by the passengers (mainly fellow-workers) and hit management hard. There should be food for thought here for British Transport workers who have tended to be rather unimaginative in their forms of struggle. It could be argued that a refusal to collect fares could lead to a lock-out by the employers. Even if this happened the passengers would clearly see that it was management, not workers, who was depriving them of transport. And it would not even be possible to counter a refusal to collect fares by a lock-out if the workers acted suddenly, without notice, and for limited periods — and then repeated the treatment later on. One might imagine similar situations in other industries, for instance postal workers behind a counter only accepting unstamped letters, or petrol pump attendants dishing out free petrol, etc, etc. It is rather arbitrary to distinguish between occupations and sit-ins. The terms are often used synonymously. It seems to me useful, however, to define sit-ins as being relatively restricted and passive in character, whereas occupation implies positive action actually to take over a plant and deny access to management. The latter predicates a high level of militancy and solidarity, as well as good rank-and-file organisation. There have been quite a lot of sit-ins in Britain over the years. Most of them have been of short duration. They have usually occurred in the mines and in the motor industry. An interesting occupation took place in July 1950, when some 200 clothing workers at the M, and L. Goldstein factory at Warren Street (in the West End) were locked out one week before their annual holiday. The factory had been the scene of a long struggle with the management, with the workers actually running the factory for two weeks and proving that the company's problems were due to defects of the management. The following account was given to the author by one of the participants. 'We decided to oppose the lock-out by staging a "stay-in", an occupation of the factory. We had to answer all the objections to this course. We were told that we would antagonise the leadership of the Tailors and Garment Workers' Union, who had been negotiating for some time, and that they would "never give us recognition". We were informed that the police would be called. Another problem was that the labour force consisted of about two-thirds women and girls. When it got to the vote almost everybody was in favour of the "stay-in". We knew that two factories in East London employing about 150 workers would strike in sympathy and that about 70 workers in the remaining unorganised factory, with about 200 employees, would also support us. 'It was decided that about half the workers would barricade themselves in the factory on the top floor. The rest including women with young children would operate from the street. This meant organising food and other supplies which would be hoisted up in buckets. 'About 100 workers proceeded to make themselves secure on the top floor. The lift was put out of action. The one door leading from the stairs was well secured. The only way in was over the roof by way of the fire escape which, in our own interests, we could not risk closing. We knew that the police would be called in and would try to get in from the roof. 'Sure enough the police arrived and surrounded the building. In the meantime we had been busy putting up banners and posters on the outside of the windows. People gathered outside and supplies began to arrive. 'We felt able to continue for a long time provided the police did not intervene. But at a meeting to discuss what to do if they did, it was decided that we did not stand much chance of resisting physically as the support on the ground was not big enough. 'Several hours later the attack came. A large force of police came over the roof-tops and into the top floor. We had to agree to leave or face a violent struggle with very limited forces. The Longbridge struggle was successful because it happened at a time of peak demand — management consequently treating the men with kid gloves for fear of sparking off a more serious conflict. Although several thousand men were laid off (and would claim full benefit), those actually in dispute received full pay ! After all they had come to their place of work. An unsuccessful sit-in took place at the Pressed Steel Plant at Linwood (now Chrysler's) in May 1965. Forty die-setters refused to be laid off and sat-in for about three hours. The police were called and 32 were arrested without any resistance. We quote this just to prove the point that there is a time and place for everything. A sit-in by a small isolated group, in a tactical situation favourable to the boss, is certainly no panacea. Unity of purpose is essential for a successful sit-in. Its absence can lead to demoralisation and to discrediting the method. Potential opportunities may also sometimes be lost because of lack of imagination and the dead weight of traditional thinking. 13 On April 13 and 14, 1971, for example, just after the 10-week major Ford dispute, an interesting situation developed in the paint shop of the Ford P.T.A. plant at Halewood. In response to the management laying off some men, 200 track workers entered the offices on two successive nights. On the second night a full-scale sit-in and obstruction of the Administration only just failed to materialise because of differences of opinion amongst the stewards. A good example of the pitfalls and of what should not be done was the abortive occupation at G.E.C. Liverpool, in October 1969. 'The fiasco was basically due to the failure of the Shop Stewards' Committee to carry the workers with them. This in turn was due to a real lack of basic information among the rank and file as to the actual aims, objectives and methods of the planned occupation. There was widespread confusion as to whether it was to be a symbolic affair, lasting at most three days, or something more serious and permanent. There were substantial and realistic misgivings about the viability of actually running a factory in isolation within the present system even for three days. And there were suspicions that the Action Committee was trying to sell them a pig in a poke. Much of the workers' opposition was due to a lack of information and to justified doubts rather than to any lack of militancy. The Company and its pawns were able to capitalise on these mistakes and drive a wedge between the mass of the men and the Action Committee. 'But much more than just information was needed by the rank and file at G.E.C. What was needed was mass involvement. The workers should not just have been presented with a plan. The whole campaign should have been preceded by shop meetings, discussing the pros and cons, especially in the weaker shops and factories. There should have been many more leaflets, many more mass meetings, which should have been regarded as part of the process of planning. But most important, workers should not only have dominated the planning and decision-taking, but should also have directly controlled the application of any decisions taken. This should have been made absolutely clear. If this had been done, the spectacle of a small group of company men breaking up and taking over a mass meeting could never have happened. Even the traditional unofficial walk-out can be made much more effective than it normally is. The participation of the ordinary worker is often limited to attending the occasional, mass meeting. He then stays at home, in isolation, watching the progress of 'his own' dispute on the goggle-box. 'Italian unions, which have no strike funds, have developed a whole new armoury of activities to minimise the cost of such withdrawals to their members, and maximise the disruptive effect. There is the chessboard strike, where every other department stops; the brushfire, or articulated strike which, over a period, rolls through every key section of a works; the pay-book strike, where every man whose cards carry an odd number is in dispute on Monday, Wednesday and Friday, while the even numbers fight out their claims on Tuesday, Thursday and Saturday; and the rather different variety of odd-and-even strike, where the blue-collar workers down tools in the morning but return after lunch, only to find (surprise, surprise !) that the white-collar clerks and foremen are now out, making all work impossible — thus achieving a full day's stoppage for only half a day's loss of pay. 'Faced with such tactics, many big and famous Italian companies had an appalling year. Italsider, the Northern Italian steel group, was crippled for months; Alfa Romeo produced 10,000 fewer cars than its planned programme, with losses which could hit its whole ambitious expansion programme in the impoverished South; and SIT-Siemens, the main telecommunications firm, employing over 15,000 people, lost a total of 4 million working hours. While such techniques can — in the short run — be effective in manipulating workers (albeit for good ends), in the long term they contribute to a lack of confidence between stewards and workers. This can become a serious problem. It is probably no coincidence that it has been particularly acute in the past at Dagenham. With such attitudes, and even with the best of intentions, it is not surprising that stewards are sometimes 'let down' by the workers they 'represent'. One of the positive effects of the recent struggle at Fords has been the move towards some reorganisation of the Shop Stewards' Committee at Dagenham, making it more responsive to the men's demands. To mobilise workers good communications are absolutely necessary. Unfortunately unofficial factory papers are few and generally poor and amateurish. Even leaflets are usually sparse and badly produced. Posters are almost non-existent. One of the best side-effects of the general upheaval on the radical left has been an increasing attention to this problem. Outside help is now more available to service rank-and-file organisations. This process of collaboration in action between the new radical movement and industrial militants has just begun. It could be a very fruitful development. One of the hurdles which has to be overcome is the traditional suspicion of industrial workers towards outsiders. We hope to see it replaced by a calculated willingness to use the abilities and services of the new movement to increase the penetration of radical ideas inside industry. The aim of this pamphlet is simple. It is to help start a critical discussion amongst industrial militants on the armoury of techniques of industrial action which are available to them. It would be foolish to follow uncritically any of the examples here described. The individual requirements of a particular situation cannot be filled by any blueprint drawn up in advance. It depends on a flexible assessment of various factors : level of consciousness of the workers, the widely varying vulnerability of various employers to various techniques, objective conditions (such as the time of year, state of demand for the firm's products) and the local situation. This pamphlet will have been well worthwhile if it gets an argument going on strategies of industrial struggle and on their relation to the socialist objective. Throughout, our thinking has been deliberately geared to this problem of the relation of ends and means. If we stress certain methods of struggle it is because they challenge fundamental managerial prerogatives — and because, for us, the whole structure of authority relations in industry and the whole question of man's fate in production are at the core of any meaningful concept of socialism. We also stress these methods because they are methods that will have to be initiated by (and are most likely to remain under the control of) those who will have to implement them. Such methods can't be used for purposes of manoeuvring or manipulation — or for getting this or that official into a position of power. They can't be absorbed by the system. 'Meaningful action, for revolutionaries, is whatever increases the confidence, the autonomy, the initiative, the participation, the solidarity, the equalitarian tendencies and the self-activity of the masses, and whatever assists in their demystification. Our pamphlet is just a beginning. As usual, we would welcome comments, criticisms, other experiences, and offers of help from our readers. A paper for militants — in industry and elsewhere. Attempts a total critique of modern society, and a systematic 'demystification' of its values, ideas, and forms of organisation. Discusses what libertarian revolution is all about. Send £1 to address below to receive forthcoming issues of the paper and pamphlets to that value. Published by Solidarity, c/o Westmoreland Road, Bromley, Kent. 1. These workers are banned from strike action under section of the Conspiracy and Protection of Property Act (1874) and the Electricity Supply Act (1919). 2. According to O.H. Parson's Labour Research Department pamphlet on the Bill (Tory War on the Unions, L.R.D., 78 Blackfriars Road, S.E.1., price 10p. ), to make the Act stick every contract of employment 'will have to define specifically and exactly every item of the job, how much work and services are expected, what method of work is to be used, the speed of the work and what overtime is compulsory. Without all this a Court would find it impossible to ascertain what interference, if any, is intended and what is likely to cause a breach of contract'. This seems to leave plenty of loopholes for the imaginative ! 3. In my view this 'discipline' should be seen as the psychological wing of Production Engineering. 4. In this case resistance to production took an unusual form ! 5. J.A.C. Brown, 'Social Psychology of Industry', Penguin, 1954, p.251. Emphasis is mine. There seems to be a lot of frustration about ! 7. From Miller and Form's Industrial Sociology, quoted by Brown,, op. cit. p.145. There is obviously a case here for workers to consider 'withdrawal of sabotage' as a useful method of struggle. 8. Most skilled toolmakers, and especially those in engineering, are expected to supply their own tools. Those provided by the company are usually inadequate both in quantity and quality. 9. Withdrawal of Goodwill', by Ken Weller, Solidarity, Vol. II, No. 1. 10. The Board has a full pay Sickness Scheme ! 12. 'Sit-in at BMC' by Ken Weller, 'Solidarity' Vol. II, No. 2. 13. A good example of how traditional thinking even affects would-be revolutionaries was seen at a public meeting of International Socialism held during the recent UPW Conference at Bournemouth to discuss the lessons of the postal strike. The main speaker (Paul Foot) derided as 'childish' and 'irresponsible' a suggestion from the floor that a march to and occupation of telephone exchanges still manned by scabs would have been a useful adjunct to the weekly marches to Hyde Park. 14. For a detailed examination of a historic occupation which has many lessons for today, see 'The Great Flint Sit-down Strike against G.M. 1936-37' by Walter Linder. Solidarity pamphlet no.31, price 8p. plus postage. 15. 'G.E.C., The Balance Sheet', Solidarity Vol. VI, No. 2. There was also an excellent account of what happened in issue No. 1 of Solidarity (West London). 16. This discussion should not be taken to imply any criticism of the rank-and-file committee who organised the epic struggle at Pilkington' s, many of whose members are still victimised. They still badly need every penny they can get, which should be sent to the Pilkington Rank and Pile Committee, 10 Greenfield Road, St Helens, Lancs. 17. What the 'traditional left' mean by an industrial strategy is usually something quite different. For them it is a question of revolutionary 'experts' analysing current economic trends and then, in their wisdom, deciding whether the economic situation requires of the Revolutionary Party that it put forward slogan A or slogan B (say 'the sliding scale of wages' or 'the sliding scale of hours'). Advocating 'correct' demands' is seen as part of the long-term process of taking the workers (who according to the view of the trad left 'can only develop a trade union consciousness') a step 'forward'. These methods are also, of course, seen (although this is less often stressed) as a means of recruiting to one's own particular vanguard outfit.